What to do with Sandy, pt III – the saga continues!? It’s been a very busy day here at the NOAA Center for Weather and Climate Prediction (NCWCP) and it’s only going to continue on this pace through the weekend. The good news is that we have some great GOES-R and JPSS products to assist the forecasters in their forecast philosophies, separate from the model mayhem we have all been hearing about or observing. I thought I would continue on a similar path as recent days and show you the players on the field as it is now another 24 hours later and some interesting things are beginning to take shape that will ultimately define the exact track of Hurricane Sandy. 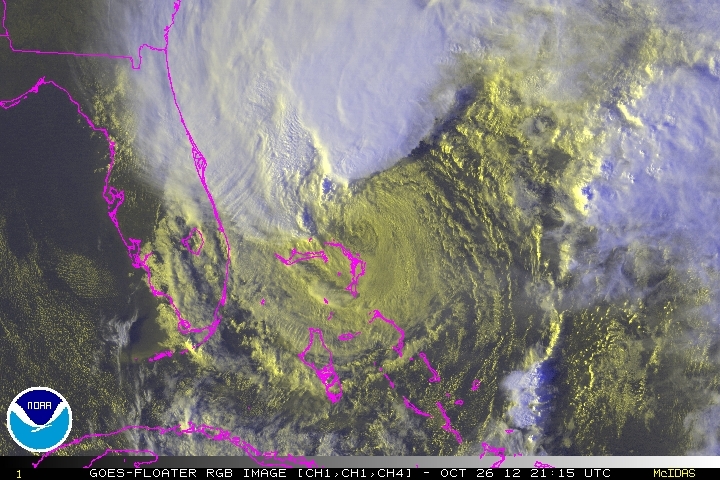 “RGB” satellite image of Hurricane Sandy valid at 2115z on 10/26/12. If you look at the above image of Sandy, you might ask. . .is she naked? Where did the thunderstorms go? Or even. . .what’s the big deal? Sandy is undergoing some serious shear at this moment with mid to upper level winds averaging around 50 knots (60 mph) helping to fan out the upper cloud pattern and strip the “eye-like” feature of deep thunderstorms. This does not mean that Sandy is not producing hurricane force winds as has been observed today by aircraft measurements. So what happened? You ask great questions. . . The upper low that was south and west of Sandy yesterday has gotten tangled up with the hurricane and therefore we are left with a very hybrid looking hurricane. This is still a significant threat for someone. . .but how do we get there? I will tell you! GOES-Sounder RGB Air Mass product with the 5 pm EDT NHC forecast track of Hurricane Sandy overlaid. As you can see above, the playing field has gotten a bit more crowded than it was the last two days and that is due to a new feature that will dictate the path of Sandy. The white line more or less outlines the developing longwave trough (large-scale pocket of cooler air). The first shortwave (red “L” in the yellow circle) is getting ready to move out of the base of the longwave trough, but will help to push Sandy a bit more north-northeast over the next 24 hours. The new player is the red “L” in the red circle in the upper-left corner. As you can see, I (poorly) drew the projected path of this feature that will help to form a closed upper-level low to the southwest of Sandy by Sunday-Monday. This will help to steer Sandy back towards the Mid-Atlantic or Southern New England by the Monday-Tuesday time frame. Although I did not highlight the area, there is still some orange coloring over Sandy which is indicative of the slow transition into a hybrid storm as it indicates some dry stratospheric air has gotten entangled with the storm. It will be interesting over the next few days to see how the upstream shortwave (latter red “L”) transfers energy to Sandy, effectively strengthening the storm! SEVIRI RGB Air Mass product over the North Atlantic valid at 21z on 10/26/12. Meanwhile, the North Atlantic has gotten more complicated as the higher latitude blocking is in full swing. The white outlined region is the expanding area of upper-level high pressure or ridge that is setting up this “blocky pattern”. The traffic jam has started and the large, complex ocean storm in the red circle with two significant shortwaves (red “L’s”) will shift southeast over the weekend, then sit and spin. . .for a while. This helps to strengthen the ridge to the north and will lead to a road-block with subsequent detour for Sandy. So, blame Greenland for being a favored location for things like this! The black circle is all that is left of Tony. I was way wrong on its evolution as I thought the larger system to the west would absorb the system, but it is wandering harmlessly towards the Canary Islands. I’m sure they can use the rain there. Finally, the little red “L” is our wandering upper-level low that will continue to bob around the North Atlantic on its long journey west. We will talk about that little guy in future posts. So, what does this mean for the East Coast? All that blocking, the complex evolution of the upper-level low forming over the Carolinas, and a hurricane will lead to very bad weather for many people up and down the East Coast, but the emphasis continues to be on the Mid-Atlantic. Some models bring the storm towards eastern Long Island and Southern New England, but I’m not jumping on that option just yet. Very high winds, heavy rain, severe coastal flooding (remember earlier posts about the full moon, large fetch, and storm surge), and potential thumping snow in the Appalachians still remain a strong possibility. We have another 24-36 hours to fully digest and analyze this complex situation, but residents along the coast and inland should prepare anyway. 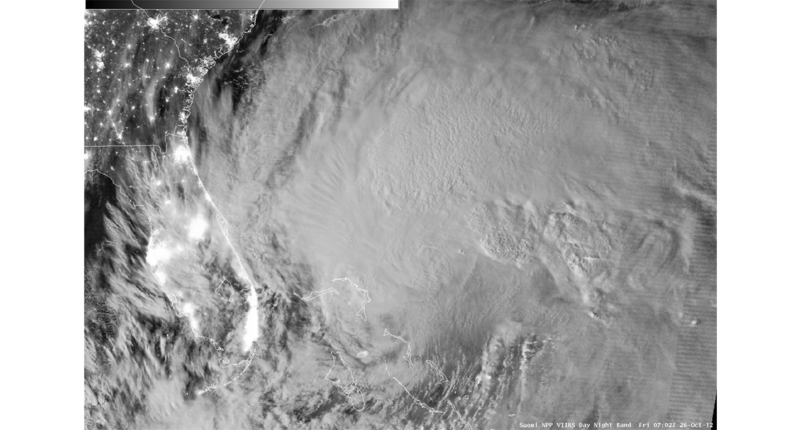 I leave you with a couple high resolution images of Sandy from the new Suomi NPP satellite’s VIIRS instrument. The first image is the Day-Night band showing a “visible-like” satellite image using light from our moon! The second images is the infrared band showing very fine details in the cloud pattern with a resolution of 375 meters! Amazing stuff for sure! A special thank you goes to Kathy Strabala for providing the imagery. The NPP VIIRS day-night band image from 0702z on 10/26/12. 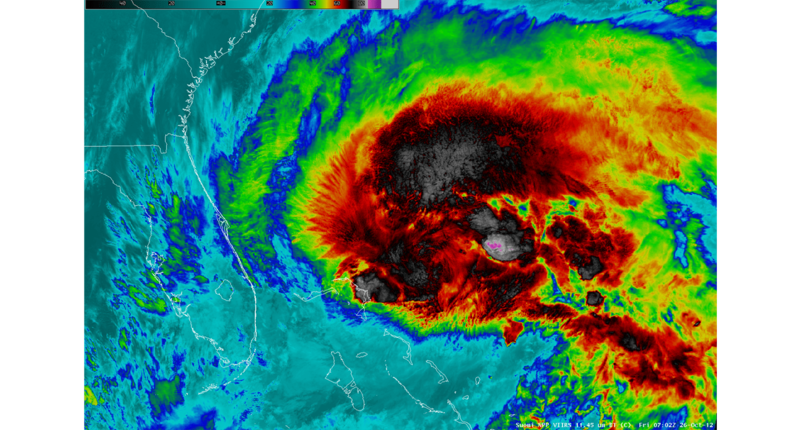 VIIRS Infrared image at 375 m resolution valid at 0702z on 10/26/12. I will continue to keep you informed over the weekend. Expect this to get more interesting as we approach the event. As I write this, I’m enjoying a view of beautiful, tropical cumulus clouds in the Baltimore area. This is courtesy of a large plume of tropical moisture that has moved north from the Gulf of Mexico, well in advance of Isaac’s remains. The remnant circulation is making its way through the Ohio Valley today and will move into western PA by late Tuesday. Heavy rain will continue to be a threat in the Mid-Atlantic to Northeast U.S. until Thursday. The Day 1-5 Quantitative Precipitation Forecast (QPF) by HPC. As you can see by the QPF forecast above, 3″ to locally 5″ of rain is expected through the next 5 days in parts of the Mid-Atlantic region. The threat for tornadoes should start to dwindle over the next few days. A series of cold fronts will move towards the Eastern Seaboard through the end of the week with the possibility of a stronger storm developing over the Ohio Valley over the weekend. Tropical Storm Leslie is struggling against moderate shear today, keeping the storm from strengthening. The current intensity is 60 mph and the center of the storm has recently become exposed from the waning thunderstorms to the southeast. 00z 09/03/12 Canadian model run showing TS Leslie off the East Coast on Sunday, 09/09/12. The track forecast for Leslie is a big challenge over the next few days. The NHC forecast shows a slow north-northwest motion over the next five days, similar to the track guidance above. I included the overnight Canadian model run which shows a close approach to the Mid-Atlantic by Sunday, 09/09. Although this is the only model showing such an approach, this is something to think about as the aforementioned developing storm next weekend in the Ohio Valley could actually “attract” Leslie. 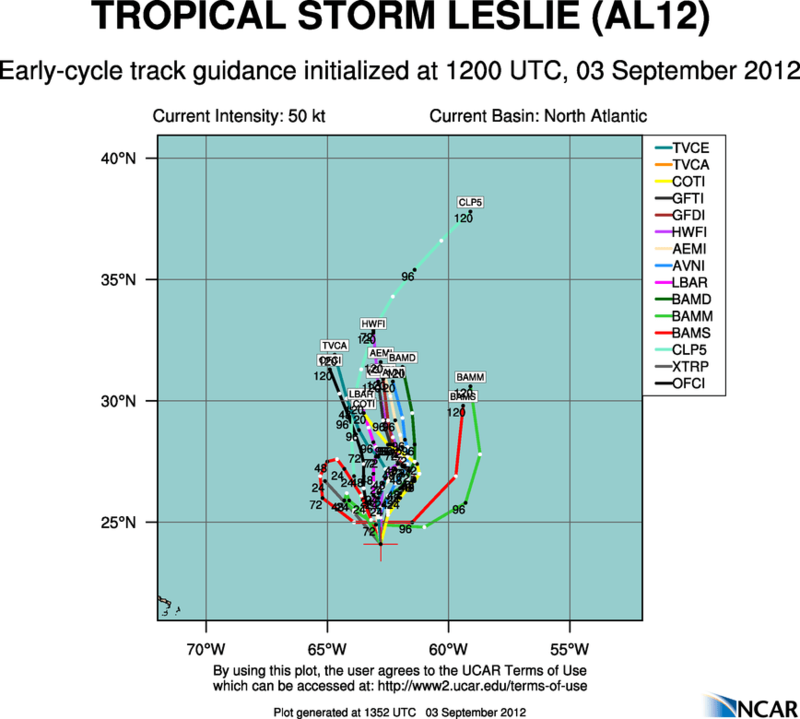 At that time, Leslie could be a modest hurricane.